Fort Lauderdale Florida is in the southeast part of the state, about 25 miles north of Miami. I lived there in 2002-2003, and the daily commute to my job in Coral Gables usually took one hour. As in much of south Florida, I-95 is jammed up during rush hours, and rush hours sometimes seem to last all day long. If you have the time, stay off I-95 and enjoy the local roads. If you are on the Florida Turnpike or I-95, several exits take you into Fort Lauderdale. Try Commercial Boulevard, Sunrise Boulevard, Davie Boulevard, Broward Boulevard and SR-84. Any of these roads will take you into the city. The heart of downtown Fort Lauderdale is the area near the intersection of US-1 and Broward Boulevard. US-1 in this part of Florida is known as Federal Highway. The history of the town begins about 1836. In that year, some early settlers named Cooley were murdered by the Seminoles. They killed Mrs. Cooley, her three children and their tutor. The Second Seminole War was under way. Major William Lauderdale led a group of Tennessee mounted militiamen to the area, and they built a fort. The men voted to name it for their commander. By 1842 the war was over, and the area was abandoned. It remained a "no man's land" until the 1890's. Frank Stranahan was the first permanent resident in 1893, opening an overnight camp for travelers and operating a ferry across the New River. He eventually built a larger house and general store on the New River that still stands today. It is located above the New River Tunnel. This tunnel is the only one in Florida, and carries US-1 (Federal Highway) under the New River. The town grew up along the New River. For many years, until after World War Two, the main population of the area was still in the areas north and south of the New River. The beach communities began to grow rapidly in the years after the war. By the time the 1960 movie, "Where The Boys Are", was made, the city was already established as the spring break capital of the country. As a Florida history buff, I love to watch that old movie. As the opening credits are rolling, the scene is from a low flying aircraft moving north up the Intracoastal Waterway. You can see the thousands of newly developed, empty canal front lots along the mainland side of the waterway. As reinforcement for the idea that the history of Florida is very young, consider that I met Frank Stranahan's widow in 1969. Frank Stranahan was the first white settler in Fort Lauderdale and his young wife, Ivy, was the town's first school teacher. Fort Lauderdale has many interesting places. I love Pier 66, the tall hotel on the intracoastal waterway that has been renovated several times in the past 40 years or so. Bahia Mar is also a great place, a resort and marina out on the beach. It has been there for years. Travis McGee, the fictional hero of 21 John D. MacDonald novels, lived at Bahia Mar. Travis lived aboard his houseboat, "The Busted Flush", at Slip F-18. 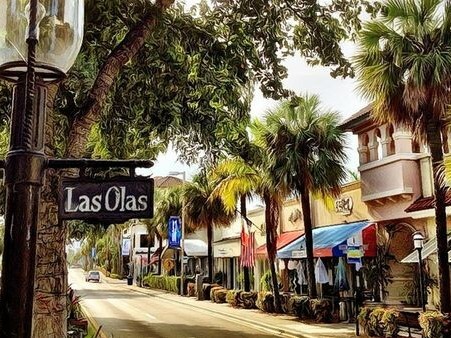 Las Olas Boulevard is a trendy shopping district that extends from US-1 east to the Atlantic Ocean. It is loaded with great restaurants and shops, and has a centerpiece of the elegant Riverside Hotel. Port Everglades is a major freight shipping terminal, and the origination point of many Caribbean cruise ships. In recent years, downtown Fort Lauderdale has seen the construction of dozens of new residential high rises. These homes along the New River and near Las Olas Boulevard epitomize the fun of living in a walkable community. Only a few years ago, the social center for Fort Lauderdale locals was the bar on top of Pier 66. This hotel bar rotated once every 66 minutes, and has a spectacular view of the city and the sea. The bar is now closed to the public, and is open only for special occasions, parties, wedding receptions and Sunday brunch. I really miss the place as an everyday watering hole. Riverside Hotel, 620 East Las Olas Blvd., Ft Lauderdale FL 33301. Tel: 954-467-0671. This has been a favorite of mine for years. I like the older building on Las Olas, although the new addition to the west is wonderful too. Fireplace in the lounge every night, summer or winter. Lago Mar Resort and Club,1700 South Ocean Lane, Ft Lauderdale FL 33316. Tel: 954-523-6511. The perfect place for a romantic weekend. Seaward of and in the shadows of Pier 66, directly on the sandy beach. La Casa Del Mar Bed & Breakfast, 3003 Granada Street, Fort Lauderdale Florida 33304. Tel: 954-467-2037. This is a nice place out on the beach not far north of Las Olas Boulevard. Great swimming pool, DSL internet. 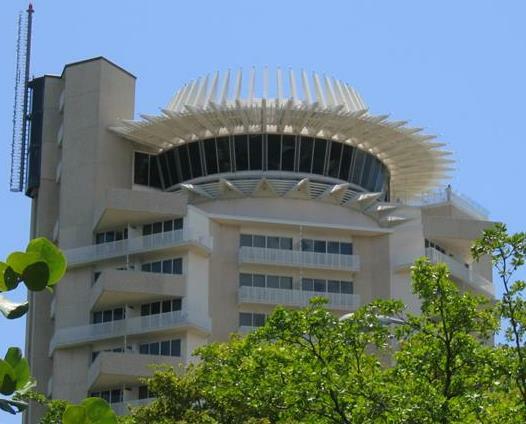 Hyatt Regency Pier Sixty-Six Resort & Spa, 2301 SE 17th Street, Ft Lauderdale FL 33136. Tel: 954-525-6666. I am still mad at them for closing the rooftop bar to the public except for Sunday brunch. I still love the place too much to boycott it. 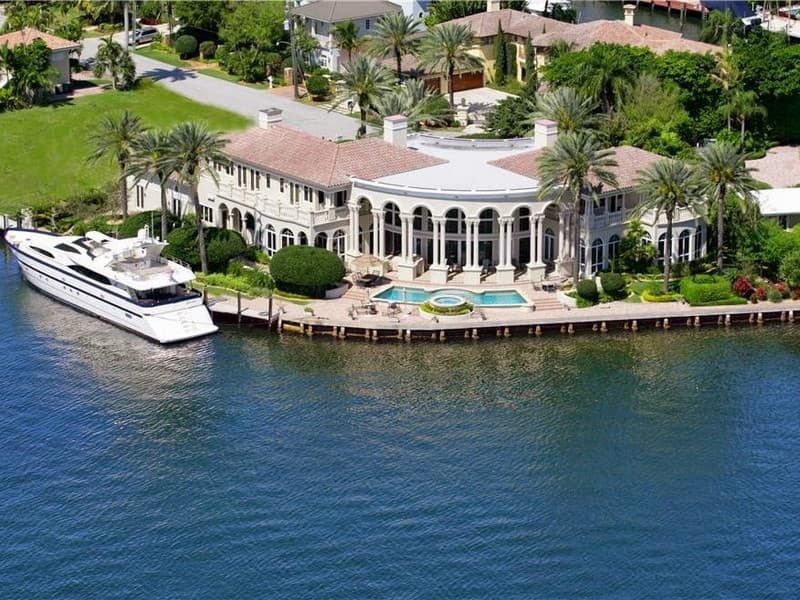 Right on the waterway, watch the parade of boats go by. 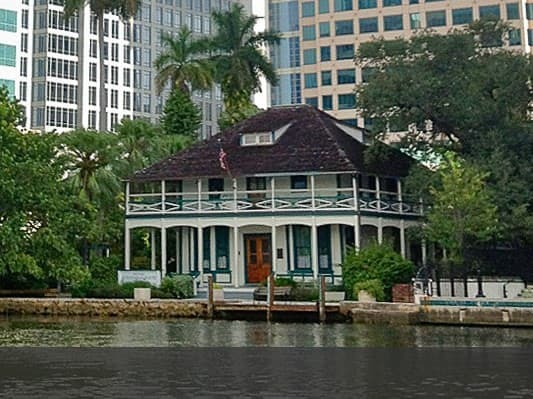 Bonnett House Museum and Gardens, 900 North Birch Rd., Fort Lauderdale, FL 33304. Tel: 954-563-5393. The Winterfest Boat Parade is held every December along the waterways in the town known as the Venice of America. Enjoy the spectacular lighting and multitude of celebrities. The Fort Lauderdale International Boat Show takes place the first weekend in November or the last weekend in October. It is one of the biggest power and sailboat shows in the USA. Dania Beach Main Street, Inc.
Giorgio's Brick Oven is one of my favorites. When ever I have time after meetings in Fort Lauderdale or Miami, I find myself lingering awhile just to enjoy a pizza at Giorgio's. Giorgio's is in a small strip shopping center, and has both inside and outside dining. The minute you enter the place you will see a long glass case full of cakes and pies and great looking salads. They have food other than pizza, of course; all of their offerings are delicious. It's just that I prefer pizza and this is about the best I've found. Their pizza is thin crust and never greasy, with multitudinous choices for toppings. On a recent visit, my companion had lobster lasagna with asparagus. She said it was delicious. Another time she had a Caesar Salad, and enjoyed it very much too. Once I had a delicious meal of grouper, fresh as could be and excellently prepared and presented. The restaurant is very small inside, almost more like an Italian deli than a sit down restaurant. There are maybe 15 tables inside. The sidewalk in front of the restaurant also has several more tables for outside dining in good weather. Giorgio's is typically filled with a friendly crowd, but you can usually find a table with only a brief wait. The food is presented well, and is always delicious. The servers are quick, efficient and pleasant. There is a large selection of wines as well, but no mixed drinks. Giorgio's is where the locals go for their pizza and light Italian meals. 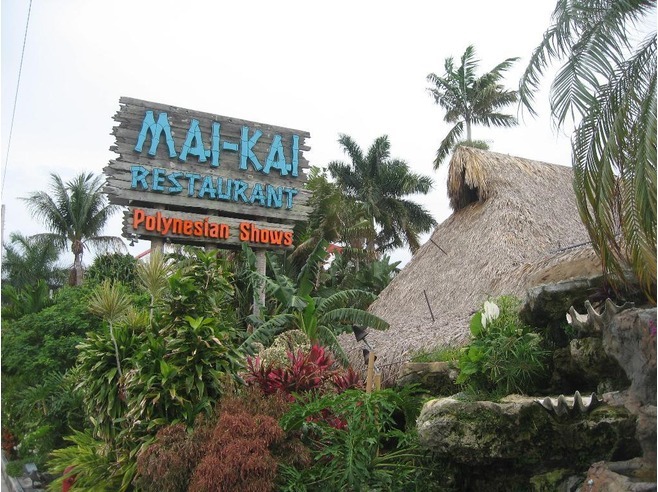 Mai Kai is a historic restaurant that is as much a tourist attraction as it is a fine dining and entertainment establishment. 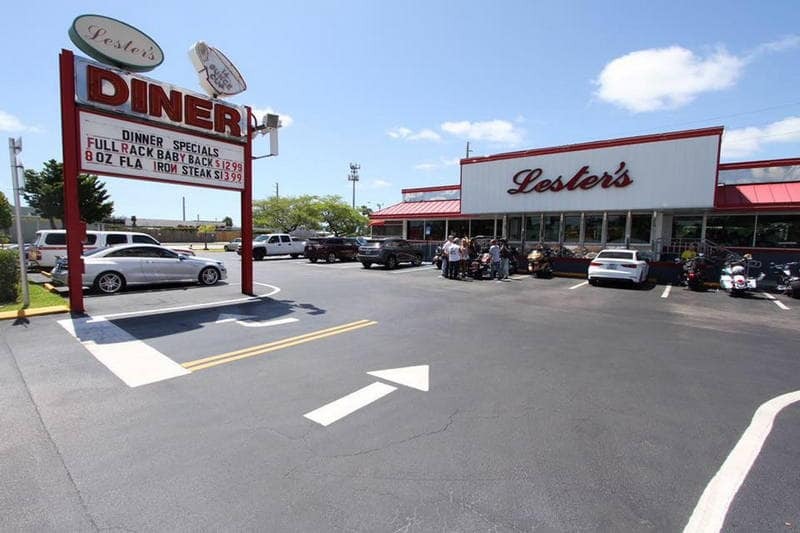 It has been one of the most popular places in Fort Lauderdale since it opened in 1956. It is now on the National Register of Historic Places. The theme of this restaurant/night club is Polynesian and you instantly feel like you are in a tropical place on some South Sea island when you step inside. This fine restaurant has an extensive menu with many selections including duck, beef, chicken, pork, seafood and even vegetarian selections. All food is prepared with Asian spices using Asian cooking techniques. 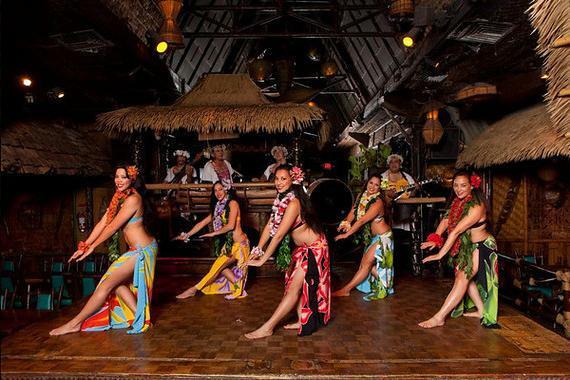 Their drinks - especially their rum specialties - are huge and it doesn't take more than one to get you in the mood for the fantastic Polynesian stage show you will enjoy after dinner. Dancers show their stuff to fantastic drum beats with lots of fiery torches and other exciting touches. The beauty of the dancers along with their grace and skill is breathtaking. The cover charge for the show is $10.95, but children 12 and under can see it for free. Reservations are needed for the main dining room and the Polynesian stage show, but you can visit the Molokai Bar for a drink without needing a reservation. It has live music and good bar food including the famous PuPu platter. Maitre d' Angel Vera has worked at Mai Kai for 52 years. Five of the more than 150 employees have been at the restaurant for more than 40 years. Service is top notch. The dress code is elegant casual. Dress up a little bit, no tee shirts and baggy shorts. No coat and tie is required, but dress like you are attending a private country club by wearing a shirt with a collar and some nice shorts or casual slacks. If you come by car, there is only a valet parking lot. Go ahead and enjoy the luxury. The entire place is fun to visit. The grounds are loaded with tropical plants, Polynesian statues, beautiful water pools and wooden bridges gently lit by torches. It feels like a fantasy land.